After being in a professional work environment for over 10 years, adjusting to the professional environment of the American College of Medical Toxicology (ACMT) was not a concern. However, I was concerned with whether or not I could put my knowledge of graphic and web design into a professional setting. I have taken all the necessary classes to design a web page but most of my experience has been limited and on a much smaller scale. I walked into this internship feeling textbook confident but during the first meeting I was asked a series of questions which left me wondering if I was in over my head. 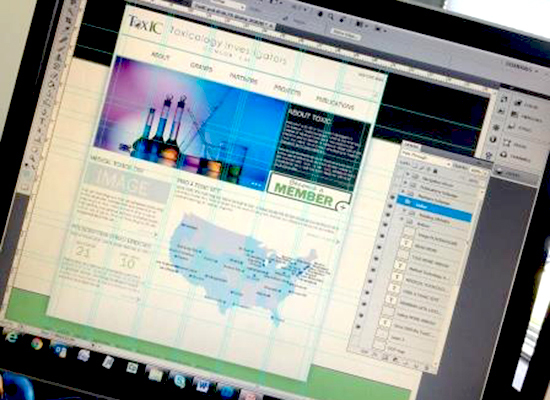 I was to do a complete redesign of the Toxicology website and create a responsive website using Photoshop. I had no idea what that consisted of but I consider myself an experienced Photoshop user. week researching every angle of responsive design including side-by-side comparisons, pros vs. cons, ideas and how to create a page with the audience in mind. One of the challenges I faced was not knowing much about the image of the company or the personality of the staff. Therefore, coming up with a design to mirror both took several different mock-up designs. In the end, I choose a more traditional design and fortunately they liked the result. Another challenge was not knowing much about the topic and content of the page. Due to this I felt limited and had to rely on the staff to tell me what information was most important and should appear on the home page. All the staff at ACMT have been willing to answer any questions that arose and my intern supervisor, Dana, has been a wonderful resource. They have been a great company to work with! As my internship comes to a close, I will continue to enhance my knowledge and skills by updating current pages to match the new design. I look forward to working with other companies in the future and expanding my skills in different areas. After graduation I plan to return to FSU and complete several graduate level certificates while deciding if pursuing a full Master’s degree is the best option for for me and my line of work.